Once per turn, you may pay 4 and sacrifice two units to play a Fear's Sum with their combined Attack/Health and Berserk. PSA: Really powerful in Forge with Pillar of Amar ... Trigger berserk attack, play land, sacrifice old one combined with new sentinel to buff, 'untap,' and remove Reckless + add Berserk again. 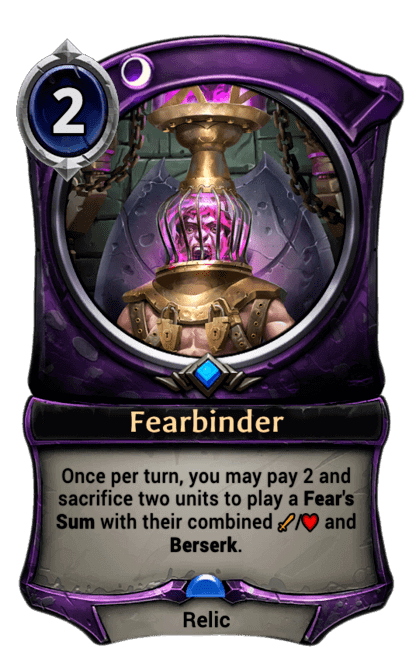 A fun note with this card: If you sacrifice a Dawnwalker and it creates a Fear's Sum with at least 5 attack while you have 4T influence, your dawnwalker is immediately brought back from the void. This can lead to some highly amusing recursion shenanigans, especially with Madness too!